Proprietary Name: Alprazolam What is the Proprietary Name? Non-Proprietary Name: Alprazolam What is the Non-Proprietary Name? Alprazolam with NDC 60760-550 is a a human prescription drug product labeled by St. Mary's Medical Park Pharmacy. The generic name of Alprazolam is alprazolam. The product's dosage form is tablet and is administered via oral form. FDA Application Number: ANDA207507 What is the FDA Application Number? Alprazolam Tablets, USP contain alprazolam which is a triazolo analog of the 1,4 benzodiazepine class of central nervous system- active compounds.The chemical name of alprazolam is 8-Chloro-1-methyl-6-phenyl-4H-s-triazolo [4,3-α] [1,4] benzodiazepine.The structural formula is represented to the right:Alprazolam is a white crystalline powder, which is soluble in methanol or ethanol but which has no appreciable solubility in water at physiological pH.Each Alprazolam tablet, USP, for oral administration, contains 0.25, 0.5, 1 or 2 mg of alprazolam Alprazolam Tablets USP, 2 mg, are multi-scored and may be divided as shown below:Complete 2 mg TabletTwo 1 mg segmentsFour 0.5 mg segmentsInactive ingredients: Lactose monohydrate, microcrystalline cellulose, sodium starch glycolate, hydroxy propyl cellulose, sodium lauryl sulfate and magnesium stearate. In addition, the 0.5 mg tablet contains FD & C Yellow 6 lake and the 1 mg and 2 mg tablet contains FD & C Blue 2 lake. CNS agents of the 1, 4 benzodiazepine class presumably exert their effects by binding at stereo specific receptors at several sites within the central nervous system. Their exact mechanism of action is unknown. Clinically, all benzodiazepines cause a dose-related central nervous system depressant activity varying from mild impairment of task performance to hypnosis. Alprazolam is extensively metabolized in humans, primarily by cytochrome P450 3A4 (CYP3A4), to two major metabolites in the plasma: 4-hydroxyalprazolam and α-hydroxyalprazolam. 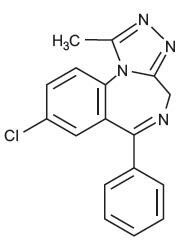 A benzophenone derived from alprazolam is also found in humans. Their half-lives appear to be similar to that of alprazolam. The plasma concentrations of 4-hydroxyalprazolam and α-hydroxyalprazolam relative to unchanged alprazolam concentration were always less than 4%.The reported relative potencies in benzodiazepine receptor binding experiments and in animal models of induced seizure inhibition are 0.20 and 0.66, respectively, for 4-hydroxyalprazolam and α-hydroxyalprazolam. Such low concentrations and the lesser potencies of 4-hydroxyalprazolam and α-hydroxyalprazolam suggest that they are unlikely to contribute much to the pharmacological effects of alprazolam. The benzophenone metabolite is essentially inactive. Alprazolam and its metabolites are excreted primarily in the urine. Changes in the absorption, distribution, metabolism and excretion of benzodiazepines have been reported in a variety of disease states including alcoholism, impaired hepatic function and impaired renal function. Changes have also been demonstrated in geriatric patients. A mean half-life of alprazolam of 16.3 hours has been observed in healthy elderly subjects (range: 9.0–26.9 hours, n=16) compared to 11.0 hours (range: 6.3–15.8 hours, n=16) in healthy adult subjects. In patients with alcoholic liver disease the half-life of alprazolam ranged between 5.8 and 65.3 hours (mean: 19.7 hours, n=17) as compared to between 6.3 and 26.9 hours (mean=11.4 hours, n=17) in healthy subjects. In an obese group of subjects the half-life of alprazolam ranged between 9.9 and 40.4 hours (mean=21.8 hours, n=12) as compared to between 6.3 and 15.8 hours (mean=10.6 hours, n=12) in healthy subjects.Because of its similarity to other benzodiazepines, it is assumed that alprazolam undergoes transplacental passage and that it is excreted in human milk. PRECAUTIONS–Drug Interactions). However, the carbamazepine dose used in this study was fairly low compared to the recommended doses (1,000mg to 1,200 mg/day); the effect at usual carbamazepine doses is unknown. Alprazolam Tablets USP were compared to placebo in double blind clinical studies (doses up to 4 mg/day) in patients with a diagnosis of anxiety or anxiety with associated depressive symptomatology. Alprazolam Tablets USP was significantly better than placebo at each of the evaluation periods of these 4-week studies as judged by the following psychometric instruments: Physician's Global Impressions, Hamilton Anxiety Rating Scale, Target Symptoms, Patient's Global Impressions and Self-Rating Symptom Scale. Vigilance and Scanning (feeling keyed up or on edge; exaggerated startle response; difficulty concentrating or 'mind going blank' because of anxiety; trouble falling or staying asleep; irritability). These symptoms must not be secondary to another psychiatric disorder or caused by some organic factor. Anxiety associated with depression is responsive to Alprazolam tablets, USP. Support for the effectiveness of alprazolam tablets in the treatment of panic disorder came from three short-term, placebo- controlled studies (up to 10 weeks) in patients with diagnoses closely corresponding to DSM-III-R criteria for panic disorder.The average dose of alprazolam tablets was 5–6 mg/day in two of the studies, and the doses of alprazolam tablets were fixed at 2 and 6 mg/day in the third study. In all three studies, alprazolam tablets was superior to placebo on a variable defined as "the number of patients with zero panic attacks" (range, 37–83% met this criterion), as well as on a global improvement score. In two of the three studies, alprazolam tablets was superior to placebo on a variable defined as "change from baseline on the number of panic attacks per week" (range, 3.3–5.2), and also on a phobia rating scale. A subgroup of patients who were improved on alprazolam tablets during short-term treatment in one of these trials was continued on an open basis up to 8 months, without apparent loss of benefit. Panic disorder (DSM-IV) is characterized by recurrent unexpected panic attacks, ie, a discrete period of intense fear or discomfort in which four (or more) of the following symptoms develop abruptly and reach a peak within 10 minutes: (1) palpitations, pounding heart, or accelerated heart rate; (2) sweating; (3) trembling or shaking; (4) sensations of shortness of breath or smothering; (5) feeling of choking; (6) chest pain or discomfort; (7) nausea or abdominal distress; (8) feeling dizzy, unsteady, lightheaded, or faint; (9) derealization (feelings of unreality) or depersonalization (being detached from oneself); (10) fear of losing control; (11) fear of dying; (12) paresthesias (numbness or tingling sensations); (13) chills or hot flushes.Demonstrations of the effectiveness of Alprazolam tablets, USP by systematic clinical study are limited to 4 months duration for anxiety disorder and 4 to 10 weeks duration for panic disorder; however, patients with panic disorder have been treated on an open basis for up to 8 months without apparent loss of benefit. The physician should periodically reassess the usefulness of the drug for the individual patient. DRUG ABUSE AND DEPENDENCE). Even after relatively short term use at the doses recommended for the treatment of transient anxiety and anxiety disorder (ie, 0.75 to 4.0 mg per day), there is some risk of dependence. Spontaneous reporting system data suggest that the risk of dependence and its severity appear to be greater in patients treated with doses greater than 4 mg/day and for long periods (more than 12 weeks). However, in a controlled postmarketing discontinuation study of panic disorder patients, the duration of treatment (3 months compared to 6 months) had no effect on the ability of patients to taper to zero dose. In contrast, patients treated with doses of alprazolam tablets greater than 4 mg/day had more difficulty tapering to zero dose than those treated with less than 4 mg/day. DOSAGE AND ADMINISTRATION for recommended tapering and discontinuation schedule). The initial step in alprazolam metabolism is hydroxylation catalyzed by cytochrome P450 3A (CYP3A). Drugs that inhibit this metabolic pathway may have a profound effect on the clearance of alprazolam. Consequently, alprazolam should be avoided in patients receiving very potent inhibitors of CYP3A. With drugs inhibiting CYP3A to a lesser but still significant degree, alprazolam should be used only with caution and consideration of appropriate dosage reduction. For some drugs, an interaction with alprazolam has been quantified with clinical data; for other drugs, interactions are predicted from in vitro data and/or experience with similar drugs in the same pharmacologic class.The following are examples of drugs known to inhibit the metabolism of alprazolam and/or related benzodiazepines, presumably through inhibition of CYP3A. Alprazolam has a weak uricosuric effect. Although other medications with weak uricosuric effect have been reported to cause acute renal failure, there have been no reported instances of acute renal failure attributable to therapy with alprazolam tablets. Inform your physician about any alcohol consumption and medicine you are taking now, including medication you may buy without a prescription. Alcohol should generally not be used during treatment with benzodiazepines.Not recommended for use in pregnancy. Therefore, inform your physician if you are pregnant, if you are planning to have a child, or if you become pregnant while you are taking this medication.Inform your physician if you are nursing.Until you experience how this medication affects you, do not drive a car or operate potentially dangerous machinery, etc.Do not increase the dose even if you think the medication "does not work anymore" without consulting your physician. Benzodiazepines, even when used as recommended, may produce emotional and/or physical dependence.Do not stop taking this medication abruptly or decrease the dose without consulting your physician, since withdrawal symptoms can occur. The use of alprazolam tablets at doses greater than 4 mg/day, often necessary to treat panic disorder, is accompanied by risks that you need to carefully consider. When used at doses greater than 4 mg/day, which may or may not be required for your treatment, alprazolam tablets has the potential to cause severe emotional and physical dependence in some patients and these patients may find it exceedingly difficult to terminate treatment. In two controlled trials of 6 to 8 weeks duration where the ability of patients to discontinue medication was measured, 7 to 29% of patients treated with alprazolam tablets did not completely taper off therapy. In a controlled postmarketing discontinuation study of panic disorder patients, the patients treated with doses of alprazolam tablets greater than 4 mg/day had more difficulty tapering to zero dose than patients treated with less than 4 mg/day. In all cases, it is important that your physician help you discontinue this medication in a careful and safe manner to avoid overly extended use of alprazolam tablets.In addition, the extended use at doses greater than 4 mg/day appears to increase the incidence and severity of withdrawal reactions when alprazolam tablets are discontinued. These are generally minor but seizure can occur, especially if you reduce the dose too rapidly or discontinue the medication abruptly. Seizure can be life-threatening. WARNINGS for additional drugs of this type). No evidence of carcinogenic potential was observed during 2-year bioassay studies of alprazolam in rats at doses up to 30 mg/kg/day (150 times the maximum recommended daily human dose of 10 mg/day) and in mice at doses up to 10 mg/kg/day (50 times the maximum recommended daily human dose).Alprazolam was not mutagenic in the rat micronucleus test at doses up to 100 mg/kg, which is 500 times the maximum recommended daily human dose of 10 mg/day. Alprazolam also was not mutagenic in vitro in the DNA Damage/Alkaline Elution Assay or the Ames Assay.Alprazolam produced no impairment of fertility in rats at doses up to 5 mg/kg/day, which is 25 times the maximum recommended daily human dose of 10 mg/day. Benzodiazepines are known to be excreted in human milk. It should be assumed that alprazolam is as well. Chronic administration of diazepam to nursing mothers has been reported to cause their infants to become lethargic and to lose weight. As a general rule, nursing should not be undertaken by mothers who must use alprazolam tablets. Side effects to alprazolam tablets, if they occur, are generally observed at the beginning of therapy and usually disappear upon continued medication. In the usual patient, the most frequent side effects are likely to be an extension of the pharmacological activity of alprazolam, eg, drowsiness or light-headedness.The data cited in the two tables below are estimates of untoward clinical event incidence among patients who participated under the following clinical conditions: relatively short duration (ie, four weeks) placebo-controlled clinical studies with dosages up to 4 mg/day of alprazolam tablets (for the management of anxiety disorders or for the short-term relief of the symptoms of anxiety) and short-term (up to ten weeks) placebo-controlled clinical studies with dosages up to 10 mg/day of alprazolam tablets in patients with panic disorder, with or without agoraphobia.These data cannot be used to predict precisely the incidence of untoward events in the course of usual medical practice where patient characteristics and other factors often differ from those in clinical trials. These figures cannot be compared with those obtained from other clinical studies involving related drug products and placebo as each group of drug trials are conducted under a different set of conditions.Comparison of the cited figures, however, can provide the prescriber with some basis for estimating the relative contributions of drug and non-drug factors to the untoward event incidence in the population studied. Even this use must be approached cautiously, as a drug may relieve a symptom in one patient but induce it in others. (For example, an anxiolytic drug may relieve dry mouth [a symptom of anxiety] in some subjects but induce it [an untoward event] in others. )Additionally, for anxiety disorders the cited figures can provide the prescriber with an indication as to the frequency with which physician intervention (eg, increased surveillance, decreased dosage or discontinuation of drug therapy) may be necessary because of the untoward clinical event. Events reported by 1% or more of Alprazolam Tablets patients are included.Incidence of Intervention Because of SymptomAlprazolam TabletsPlaceboAlprazolam TabletsNumber of Patients565505565% of Patients Reporting:Central Nervous SystemDrowsiness41.021.615.1Light-headedness20.819.31.2Depression13.918.12.4Headache12.919.61.1Confusion9.910.00.9Insomnia8.918.41.3Nervousness4.110.31.1Syncope3.14.0None reportedDizziness1.80.82.5Akathisia1.61.2Tiredness/Sleepiness1.8GastrointestinalDry Mouth14.713.30.7Constipation10.411.40.9Diarrhea10.110.31.2Nausea/Vomiting9.612.81.7Increased Salivation4.22.4CardiovascularTachycardia/Palpitations7.715.60.4Hypotension4.72.2SensoryBlurred Vision6.26.20.4MusculoskeletalRigidity4.25.3Tremor4.08.80.4CutaneousDermatitis/Allergy3.83.10.6OtherNasal Congestion7.39.3Weight Gain2.72.7Weight Loss2.33.0In addition to the relatively common (ie, greater than 1%) untoward events enumerated in the table above, the following adverse events have been reported in association with the use of benzodiazepines: dystonia, irritability, concentration difficulties, anorexia, transient amnesia or memory impairment, loss of coordination, fatigue, seizures, sedation, slurred speech, jaundice, musculoskeletal weakness, pruritus, diplopia, dysarthria, changes in libido, menstrual irregularities, incontinence and urinary retention. DOSAGE AND ADMINISTRATION). Some patients may benefit from an even slower dosage reduction. In a controlled postmarketing discontinuation study of panic disorder patients which compared this recommended taper schedule with a slower taper schedule, no difference was observed between the groups in the proportion of patients who tapered to zero dose; however, the slower schedule was associated with a reduction in symptoms associated with a withdrawal syndrome. Psychological dependence is a risk with all benzodiazepines, including alprazolam tablets. The risk of psychological dependence may also be increased at doses greater than 4 mg/day and with longer term use, and this risk is further increased in patients with a history of alcohol or drug abuse. Some patients have experienced considerable difficulty in tapering and discontinuing from alprazolam tablets, especially those receiving higher doses for extended periods. Addiction-prone individuals should be under careful surveillance when receiving alprazolam tablets. As with all anxiolytics, repeat prescriptions should be limited to those who are under medical supervision. 50 in rats is 331–2171 mg/kg. Other experiments in animals have indicated that cardiopulmonary collapse can occur following massive intravenous doses of alprazolam (over 195 mg/kg; 975 times the maximum recommended daily human dose of 10 mg/day). Animals could be resuscitated with positive mechanical ventilation and the intravenous infusion of norepinephrine bitartrate. Overdosage reports with alprazolam tablets are limited. As in all cases of drug overdosage, respiration, pulse rate, and blood pressure should be monitored. General supportive measures should be employed, along with immediate gastric lavage. Intravenous fluids should be administered and an adequate airway maintained. If hypotension occurs, it may be combated by the use of vasopressors. Dialysis is of limited value. As with the management of intentional overdosing with any drug, it should be borne in mind that multiple agents may have been ingested.Flumazenil, a specific benzodiazepine receptor antagonist, is indicated for the complete or partial reversal of the sedative effects of benzodiazepines and may be used in situations when an overdose with a benzodiazepine is known or suspected. Prior to the administration of flumazenil, necessary measures should be instituted to secure airway, ventilation and intravenous access. Flumazenil is intended as an adjunct to, not as a substitute for, proper management of benzodiazepine overdose. Patients treated with flumazenil should be monitored for re-sedation, respiratory depression, and other residual benzodiazepine effects for an appropriate period after treatment. PRECAUTIONS should be consulted prior to use. Treatment for patients with anxiety should be initiated with a dose of 0.25 to 0.5 mg given three times daily. The dose may be increased to achieve a maximum therapeutic effect, at intervals of 3 to 4 days, to a maximum daily dose of 4 mg, given in divided doses. The lowest possible effective dose should be employed and the need for continued treatment reassessed frequently. The risk of dependence may increase with dose and duration of treatment.In all patients, dosage should be reduced gradually when discontinuing therapy or when decreasing the daily dosage. Although there are no systematically collected data to support a specific discontinuation schedule, it is suggested that the daily dosage be decreased by no more than 0.5 mg every 3 days. Some patients may require an even slower dosage reduction. Treatment may be initiated with a dose of 0.5 mg three times daily. Depending on the response, the dose may be increased at intervals of 3 to 4 days in increments of no more than 1 mg per day. Slower titration to the dose levels greater than 4 mg/day may be advisable to allow full expression of the pharmacodynamic effect of alprazolam tablets. To lessen the possibility of interdose symptoms, the times of administration should be distributed as evenly as possible throughout the waking hours, that is, on a three or four times per day schedule.Generally, therapy should be initiated at a low dose to minimize the risk of adverse responses in patients especially sensitive to the drug. Dose should be advanced until an acceptable therapeutic response (ie, a substantial reduction in or total elimination of panic attacks) is achieved, intolerance occurs, or the maximum recommended dose is attained. In all patients, dosage should be reduced gradually when discontinuing therapy or when decreasing the daily dosage. Although there are no systematically collected data to support a specific discontinuation schedule, it is suggested that the daily dosage be decreased by no more than 0.5 mg every three days. Some patients may require an even slower dosage reduction.In any case, reduction of dose must be undertaken under close supervision and must be gradual. If significant withdrawal symptoms develop, the previous dosing schedule should be reinstituted and, only after stabilization, should a less rapid schedule of discontinuation be attempted. In a controlled postmarketing discontinuation study of panic disorder patients which compared this recommended taper schedule with a slower taper schedule, no difference was observed between the groups in the proportion of patients who tapered to zero dose; however, the slower schedule was associated with a reduction in symptoms associated with a withdrawal syndrome. It is suggested that the dose be reduced by no more than 0.5 mg every 3 days, with the understanding that some patients may benefit from an even more gradual discontinuation. Some patients may prove resistant to all discontinuation regimens. To treat anxiety disordersfor the short-term relief of the symptoms of anxietyto treat panic disorder with or without a fear of places and situations that might cause panic, helplessness, or embarrassment (agoraphobia)Alprazolam is a federal controlled substance (C-IV) because it can be abused or lead to dependence. Keep alprazolam tablets in a safe place to prevent misuse and abuse. Selling or giving away alprazolam tablets may harm others, and is against the law. Tell your healthcare provider if you have abused or been dependent on alcohol, prescription medicines or street drugs. It is not known if alprazolam tablets are safe and effective in children.Elderly patients are especially susceptible to dose related adverse effects when taking alprazolam tablets.It is not known if alprazolam tablets are safe and effective when used to treat anxiety disorder for longer than 4 months.It is not known if alprazolam tablets are safe and effective when used to treat panic disorder for longer than 10 weeks.Do not take alprazolam tablets if:you are allergic to alprazolam, other benzodiazepines, or any of the ingredients in alprazolam tablets. See the end of this Medication Guide for a complete list of ingredients in alprazolam tabletsyou are taking antifungal medicines including ketoconazole and itraconazoleBefore you take alprazolam tablets, tell your healthcare provider about all of your medical conditions, including if you:have or have had depression, mood problems, or suicidal thoughts or behaviourhave liver or kidney problemshave lung disease or breathing problemsare pregnant or plan to become pregnant.Alprazolam tablets may harm your unborn baby. You and your healthcare provider should decide if you should take alprazolam tablets while you are pregnant.are breastfeeding or plan to breastfeed. Alprazolam passes into your breast milk and may harm your baby. Talk to your healthcare provider about the best way to feed your baby if you take alprazolam tablets. You should not breastfeed while taking alprazolam tablets.Tell your healthcare provider about all the medicines you take, including prescription and over-the-counter medicines, vitamins, and herbal supplements. Taking alprazolam tablets with certain other medicines can cause side effects or affect how well alprazolam tablets or the other medicines work. Do not start or stop other medicines without talking to your healthcare provider. How should I take alprazolam tablets?See "
What is the most important information I should know about alprazolam tablets?" Take alprazolam tablets exactly as your healthcare provider tells you to take it. Your healthcare provider will tell you how much alprazolam tablets to take and when to take it.If you take too much alprazolam tablets, call your healthcare provider or go to the nearest hospital emergency room right away.What should I avoid while taking alprazolam tablets?Alprazolam Tablets can cause you to be drowsy. Do not drive a car or operate heavy machinery until you know how alprazolam tablets affect you.You should not drink alcohol while taking alprazolam tablets. Drinking alcohol can increase your chances of having serious side effects.What are the possible side effects of alprazolam tablets? Abuse and dependence. Taking alprazolam tablets can cause physical and psychological dependence. Physical and psychological dependence is not the same as drug addiction. Your healthcare provider can tell you more about the differences between physical and psychological dependence and drug addiction. Withdrawal symptoms. You may have withdrawal symptoms if you stop taking alprazolam tablets suddenly. Withdrawal symptoms can be serious and include seizures. Mild withdrawal symptoms include a depressed mood and trouble sleeping. Talk to your healthcare provider about slowly stopping alprazolam tablets to avoid withdrawal symptoms. Seizures. Stopping alprazolam tablets can cause seizures and seizures that will not stop (status epilepticus). Mania. Alprazolam Tablets may cause an increase in activity and talking (hypomania and mania) in people who have depression. The most common side effects of alprazolam tablets include drowsiness and light-headedness. These are not all the possible side effects of alprazolam tablets. Call your doctor for medical advice about side effects. You may report side effect to FDA at 1-800-FDA-1088. How should I store alprazolam tablets?Store alprazolam tablets between 20°C to 25°C (68°F to 77°F). Protect from light. Dispense in tight (USP), light-resistant, child-resistant containers. Keep alprazolam tablets and all medicines out of the reach of children.General information about the safe and effective use of alprazolam tablets.Medicines are sometimes prescribed for purposes other than those listed in a Medication Guide.Do not use alprazolam tablets for a condition for which it was not prescribed.Do not give alprazolam tablets to other people, even if they have the same symptoms that you have. It may harm them.You can ask your pharmacist or healthcare provider for information about alprazolam tablets that is written for health professionals.For more information, contact Breckenridge Pharmaceutical, Inc. at 1-800-367-3395, or go to www.bpirx.com. What are the ingredients in alprazolam tablets? Inactive ingredients: Lactose monohydrate, microcrystalline cellulose, sodium starch glycolate, hydroxy propyl cellulose, sodium lauryl sulfate and magnesium stearate. In addition, the 0.5 mg tablet contains FD & C Yellow 6 lake and the 1 mg and 2 mg tablet contains FD & C Blue 2 lake. Hinjewadi, Pune, Maharashtra 411057, India.